The “Where Else But The Streets” art show opens at Stone Malone Gallery, Saturday May 28th at 7 p.m., with Shepard Fairey, Teachr, Free Humanity, LydiaEmily, and others featured in the new street art dossier. 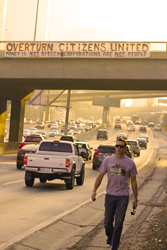 MAN ON FIRE: Teachr walks away from his banner drop in LA rush hour. The Stone Malone Gallery, one of Hollywood’s top art galleries according to CBS-LA, welcomes a one-of-a-kind art show opening Saturday May 28th, “Where Else But The Streets.” This group art show of top political street artists, running for a week before the California Primary on June 7th, celebrates the release of the new photo journal, "Where Else But The Streets: A Street Art Dossier," by John Wellington Ennis, now out from Rothco Press. Artists from the book are featured in the gallery show, including Shepard Fairey, Teachr, Free Humanity, Lydia Emily, Plastic Jesus, Morley, All The Girls Love Earl, Toolz, Sabo, The PSA Crew, among others. Shepard Fairey will be exhibiting four new works for sale, previously released as limited-edition prints calling for campaign finance reform. Fairey designed the movie poster for Ennis’s money-in-politics documentary "PAY 2 PLAY: Democracy’s High Stakes" and his artwork also appears in the film. The award-winning lithograph of the Obey Giant "PAY 2 PLAY" poster will also be on display at the gallery show and available for sale. Says Ennis, “It’s especially exciting to celebrate the book release here on the Melrose strip, where most of the street art in the book and the film went down.” Artwork will be priced for both street art fans and interested collectors. Ennis’s new street art book is an off-shoot of his documentary, which includes top L.A. street artists Alec Monopoly, Free Humanity, Lydia Emily, Teachr, Gregory Siff, and others. After releasing the film, Ennis realized that not only did he still have numerous interviews with street artists left over, he also had amassed a trove of photographs from a particularly vibrant period of street art in Los Angeles, 2010-2012. From the release of the hit documentary Exit Through The Gift Shop through Occupy Wall Street, the streets were lit up with creative displays, recounted through interviews, photo spreads, and short documentaries on the artists accompanying the ebook version. Signed copies of the book will be available at the gallery opening party, sponsored by Jack Daniels and Pabst Blue Ribbon. Music provided by Proper Propaganda from Radio Free Brooklyn. There will be poster giveaways for the first 50 in line and gift bags of stickers for the first 15 in line. The show opens at 7 pm, this Saturday, May 28th, at Stone Malone Gallery on 7619 1/2 Melrose Ave., LA, CA 90046, and runs for a week. For inquiries, contact John Wellington Ennis at ennis(at)shootfirstinc(dot)tv or call the gallery at 313.782.7070. Artwork from this event will be available to purchase online at stonemalonegallery.com when the show opens.